Sean is an outpatient client with Easter Seals. 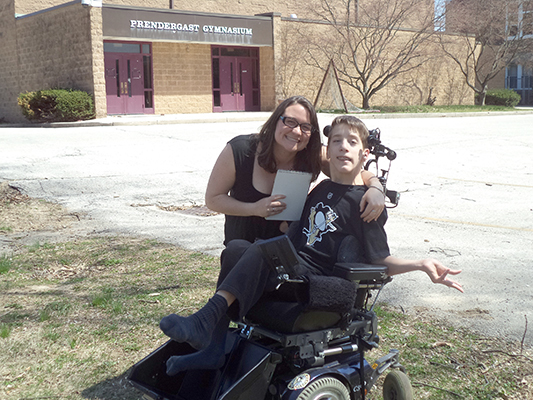 This interview was conducted following a game with his power wheelchair floor hockey team. Interviewer: I am here with Sean Hesser after his third game with the Philadelphia Power Play Team. How are you feeling right now? Sean: I am exhausted and I keep breaking sticks every time. Sometimes I get a little frustrated but my team won. Interviewer: Your team won. Congratulations! Interviewer: How did your sticks break while you were playing? Sean: The coach told me I was too aggressive. I kept bumping into others accidentally. Somehow the red button for pushed on the back of my chair. Interviewer: What is the red button, Sean? Sean: It causes the chair to stop. Interviewer: I see you spent some time in the penalty box. Why? Sean: I just kept banging into people. Interviewer: Do you use anything other than the stick to block the ball? Sean: I basically use my body, my leg and it could be the wheel. Interviewer: Have you ever gotten hurt? Interviewer: Tell me about your assist. Sean: Well, it hit the wheel on the right side. And you know how people do it with their skate and they just hit it. That was it. Interviewer: I also noticed you don’t play defense. Do you have a choice in what you can play? Sean: I just did that three games ago. I asked the coach if I could changes positions and he said sure. And I moved to left wing because I am good at speed. Interviewer: Do you like defense better? Sean: I like offense better. It is all over the place and I move around more. Interviewer: How does your team feel about you being so vocal on the bench? Sean: I tell them to force it, pressure, shoot. I was a coach. I have seen people do that. Interviewer: What happens when people crash? Is that why you got your penalty? Sean: I accidentally smashed into her with my chair. It’s called ramming or roughing. Interviewer: That was my last question. Do you have anything else you want to add. Sean: At least my team won with a 2 goal game. 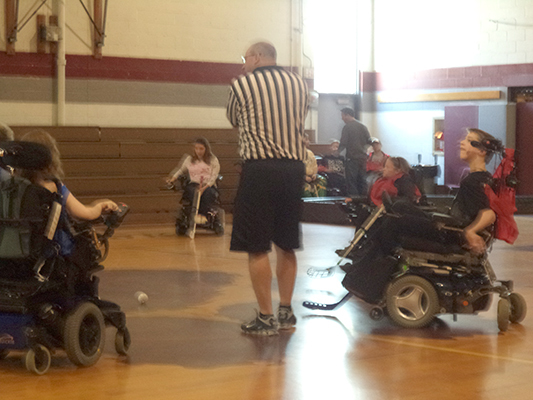 This entry was posted in child stories and tagged Easter Seals, recreation, wheelchair hockey on July 10, 2014 by Easterseals.